In an irony that hasn't gone unnoticed, an over-zealous spam filter stopped us from receiving Ben Graham's feature until after No Music Day on Saturday. For Bill Drummond, thorn in the side of the art community and the music industry, we have all the time in the world however, so here it is . . .
"Hello, I’m Bill." Bill Drummond looms over me; tall, bespectacled, grey-haired but tanned and healthy, belying his 56-years. I don’t see him come over as I’m distracted, watching through the glass doors of Broadcasting House a soundless TV announcing the death of actor Edward Woodward. Woodward starred in cult classic The Wicker Man, largely filmed in Newton Stewart, where Drummond grew up, the son of a long line of Scottish missionaries, preachers and ministers. The spirit of the film was flickering in the background during his situationist/promotional spectacle on the Isle of Jura, when incinerating currency alongside Jimmy Cauty. Adjourning to a greasy spoon around the corner, Bill orders tea (weak, black), and a plate of liver and bacon. We don’t talk about Edward Woodward. We don’t really talk about the JAMMs, or the KLF, or the trajectory of mysticism, artistic contrariness, warped idealism, obsession and self-disgust that led to Bill and Jimmy infamously burning a million quid in 1994, or indeed the many other equally fascinating and infuriating artistic endeavours Bill has been involved in since. We talk, instead, about No Music Day, which Bill initiated in 2005 for, as ever, personal, instinctive reasons; a feeling that he wanted to explore his own relationship with music and its increasing pervasiveness in our lives, the way in which we consume it so readily and take it for granted. Again, as ever, it swiftly grew into a more public project, with both the media and the man in the street embracing and attacking the idea in equal measures. Take, for instance, the response of reactionary columnist Charles Spencer in a recent Daily Telegraph, castigating "the absurd Mr Drummond, and all the other bossy nay-sayers who presume to tell us how to live". It’s strange that this simple notion of a day of abstinence should arouse such unlikely passions, and that alone surely makes the project worthwhile. But after five years of organising and promoting No Music Day, Drummond is ready to move on and hand over the reins. "It’s as though I’ve written a play, and I’ve directed it for five terms," he says. "But now the play is out there, and other people can do what they want with it." Bill Drummond: So it’s more of a day that they’re likely to be consuming music? Yes, and also it’s more likely to be a personal choice, rather than being in a work environment, where you don’t have the choice. BD: Oh, where you’re gonna hear music anyway. I hadn’t really taken that into account. I knew that it was going to be on a Saturday, and if I’d been planning it, it would’ve been nice to know that the last of the five years is on a Saturday, that’s good. When I was a teenager, if I went to see a band, it would be on a Saturday night, and that’d be the day I would buy records. So it would be the high musical day of the week. Was it always a five year plan, from the start? BD: It wasn’t, no. I hadn’t really thought it through. I thought, let’s have a No Music Day, it was a personal thing, and then it became, it wasn’t a personal thing anymore, and after the second year, it was more about me going out there trying to convert… someone had to sell the idea of this thing. And that’s when I thought: "Let’s leave it as a five year thing." And also, when I first had the idea, the idea of doing a day for something still had a certain cache. And now everything has its day, and even as an ironic point of view, it’s used in advertising campaigns for this, that and the other. So I knew, quite early on, by the second year I was doing it, that I wanted to bring it to an end eventually. Do you think there’s a sense that people’s response to No Music Day is coloured by their perception of you, or rather their image of you through the media? BD: Everything I do… stuff that I’ve done in the past will cast a long shadow over everything else that I ever do, you know. I accept that. I’m not the first person to suffer from that sort of thing, if it is suffering from it; but that said, it’s encouraged me to work in a way that, a lot of the things I do, they don’t have my name attached to them, and I put things out there anonymously. So that matters, that that shadow isn’t cast over it. But to an extent, if you go the No Music Day website, up until this year anyway, there’s no mention of me, my name’s not there, it’s not like it’s billed as a Bill Drummond project or something. That’s slightly different now, because there’s an events page up, which does have my name on it. I’ve noticed that a lot of people get surprisingly upset and angry about the idea of No Music Day, and I think a lot of it is this sense that here is the guy who burnt a million quid, and now he’s telling us that we can’t listen to music. BD: Yeah, yeah, yeah… obviously, I’m not telling anybody that they can’t listen to music. It’s more of an invitation - with a slight irony in it, I guess, even though I don’t like slight irony - to consider these issues. Sure. I’ve always taken it as just having a day out from listening to music, in order to appreciate music more, the rest of the time. But I know that, as with a lot of your projects, you like to put out these things more as a question, you don’t like to give answers. If I were to say to you, what’s it’s all about, what does it represent? I imagine that you wouldn’t want to give me a definite answer. BD: No, but not because I’m sitting here trying to play a game with you, not at all. But just because I couldn’t! I mean, you’re right . . . it’s throwing something out there . . . It’s so easy to sit down and listen to something and think, that’s rubbish, or that person over there has got bad taste because they listen to this, or I’m better than them because I listen to that, it’s just so easy for us to do. And increasingly so, as over the last five years that you’ve been doing No Music Day it’s coincided with us all getting access to all music, all for free, through our computers. BD: When file-sharing sites first came about I thought "Wow, this is fantastic. It’s democratising the music industry, it’s changing the whole power structure of music." And when iPods came out, in a sense I thought they were great as well; I could be anywhere, at any time, standing on a platform with all my music, everything I could ever want to listen to, all in this little box. But I found myself just flipping through the tracks. And I thought, this is just because I’m getting on, I'm jaded… but then I was aware that my teenage daughters were doing it, I’d see people in their twenties doing it, you know. I was aware that our relationship with music was changing; this was speeding it up or something. And usually I like that sort of change; I like to see where it’s going to lead to. So yeah, that has been an ongoing change in our relationship with music since the start of No Music Day. So I’m not anti-iPods, or anti-file-sharing sites, I still think that they’re great things, but I’m aware that they’ve really sped up and changed the way that people think about music, and the way that people will make music in the future. Do you keep up much with new musical forms, even if it’s just in the general sense of the idea of dubstep or whatever? BD: Do I keep up with it? Yes, in any sense, even if it’s just keeping up with it as a phenomenon, rather than actually listening to it. Are you interested in the emergence of new musical styles? BD: I know what you’re saying. Erm… [long silence] I’m not really interested in… are you aware that I’ve been doing this thing called The 17? Well, through that I’ve found that actually No Music Day has infected a lot of the days in the year. So I no longer have a CD player, I don’t have an iPod… Well, I’ve got this phone and I could keep tracks on that, but I don’t have any tracks on that, I don’t go to music clubs anymore, I don’t listen to music on the radio, so I hardly listen to music. It’s all been thrown out. Every time I hear recorded music it sounds, yuck, old-fashioned to me, whatever the genre is. That said, I have children, I live with my 22-year-old son, music’s a big part of his life, so I hear it by accident, and he’s always talking about stuff… I have a 14-year-old daughter, and a 13-year-old daughter, so I’m exposed to what they listen to; on that level, I get exposed to a ton of stuff. But on the whole, for me, it just sounds like something from another century. It all sounds old-fashioned, as a whole thing. But I would imagine that even if recorded music as a form sounds old-fashioned to you, given your past interests, you would find it hard not to have at least a detached interest in what young people are listening to and where pop music is going. BD: I didn’t know that! I’ll be straight on the computer when I get home! Maybe that’s what drew me in. Maybe I’ll discover that I’m the man behind Lady Gaga! That would be a bit strange. BD: I’m aware of it, yeah. BD: They didn’t try hard enough. They didn’t try hard enough making their record, either. **Speaking as well about the Illuminatus! books, Ken Campbell died last year. He was an important figure in your life, wasn’t he? [Drummond was introduced to Robert Anton Wilson’s Illuminatus! trilogy by maverick theatre director Ken Campbell in 1976; he became a set designer for the Science Fiction Theatre Company of Liverpool and worked on Campbell’s twelve-hour adaptation of the books, helping sell the production to the National Theatre in London before leaving to buy some glue mid-tour, never to return. Ideas and imagery from the Illuminatus! books would recur throughout Drummond’s work, with the JAMs /KLF especially]. BD: A huge influence, if not the biggest influence, as a creative person. Did that influence continue to inform your work? BD: More his force of personality, in the way he worked in the now. He was always working in the now, he wasn’t thinking in terms of making films, writing books; it was always like, the event, what’s actually happening in the room. That was one of the big things I learnt from Ken Campbell. And taking risks, and just making things happen. That continued to inspire me about what he does, what he did do, right up until he died. And so I always got a lot out of getting together with Ken Campbell, or going to see a Ken Campbell production. Although he had no interest in music whatsoever; he was just focussed in on what he was doing. 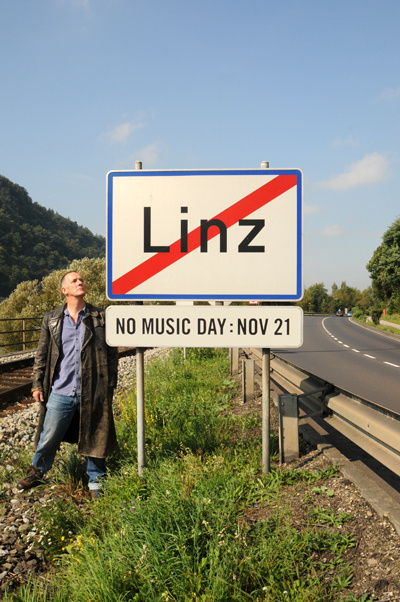 Going back to No Music Day, Linz in Austria is officially recognising it this year. How did that come about? 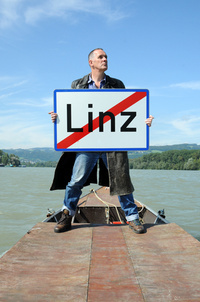 BD: Linz were doing this thing called the Horstadt initiative, and they wanted to be the first city in Europe where, if somebody’s getting building permission for a building, it’s not just about what the building looks like and how it’s structured, but what noise did it give off in the building, and they wanted to take into account the whole sound of the city. And I think from that, they discovered No Music Day. And then they approached me, not knowing who I was, they just saw No Music Day, and sent an email through. And that’s how my involvement came about. So they planned all their activities to do with this Horstadt initiative, from a certain point earlier this year, to culminate this Saturday, the 21st. So I went over in February, had meetings with them, and I’m going to be getting involved. And so that’s how it came about. Last year there seemed to be a big thing in Brazil, where the whole nation was going to get behind it. To what extent did that come off? BD: I got an invitation from some people in Brazil; they wanted to be involved with No Music Day in some way. So, just based on my pre-conceived notions of Brazil, which is like, non-stop football to a soundtrack of non-stop samba, you just get the idea that this is going to be the most musical country in the world. So I loved the idea of No Music Day in Brazil. I knew that it could only fail. I knew that there’s no serious… you see, it wasn’t like the year before, which was BBC Radio Scotland, and it was from the top down, where the chairman says, okay, this is what the station’s doing. But the Brazil thing is just a few people saying they want to do it, and I’m going, yeah, here, and lending them the concept. And each year, whether it’s BBC Radio Scotland, or Brazil, or Linz in Austria, people have come forward with their own ideas. So when I went to Brazil, what they had done is translated the statement, printed the leaflets, and they’d organised me to do interviews with radio stations, or the Brazilian equivalent of yourself, or the Brazilian edition of Rolling Stone magazine, and all these different things. But actually, on No Music Day, it was just handing out leaflets. So I thought, okay, I’ll stand on the street handing out leaflets. Even going into music shops and telling them, through the translator, this is No Music Day. So in a sense, I was their puppet, but I didn’t mind that, I kind of liked the idea that this was what I was doing. And what sort of response were you getting? BD: Well… I built up confidence. I ended up in this main shopping street in Sao Paolo, where everyone was listening to their iPhones or whatever, so I was just, "Excuse me," straight in, in English, no apologies. "Excuse me it’s No Music Day today," and I just handed them the leaflet, which was in Portuguese. Most people were just, "Oh, okay," and they’d just take it off and walk away. And I mean, maybe it’s just cos I’m big, and they were like, "Who’s this nutter? I’m not going to argue with him." And going up to people who were buskers and telling them. And one poor busker, she was a girl, and she said "Oh no, this is my first day of being a busker." And she thought we were from the police or something, telling her that she couldn’t make music. Well, the other stereotype that you think of in Brazil is of government militia death squads. So I suppose you’re going to err on the side of caution if someone tells you it’s officially No Music Day, otherwise you might end up disappearing, never to be seen or heard of again. BD: The weird thing was, while I was there I saw nobody play football, and I didn’t hear any samba music. And I didn’t play any. Do you keep tabs on people like Echo and the Bunnymen and Julian Cope, and keep up with what they’re doing these days? BD: Not really. I’m friends with Will Sergeant, and sort of with Ian McCulloch. But I’ve got a close relationship with Will Sergeant, even if we don’t see each other for a year or two, I know we’re friends, and we always will be. So I always wish them well with what they’re doing. But I haven’t heard the new record. You know, my 22-year-old son’s not playing it, and my 14-year-old daughter’s not playing it. BD: He has. And it’s fantastic, yeah. I don’t necessarily get the music, but I like the fact that he does what he does, and goes off in all different directions. Have you read any of his books? Did you read his Liverpool scene book? BD: I think I read the first one… erm… but I can’t remember if it was good or not. But I think he’s a good writer. I know he’s good. But I don’t have the stone circle ones. But I’ve given them as presents to people, as Christmas presents and things. I think you’re a very good writer. You’re a very good storyteller, and you draw people in, but also you distance them slightly by admitting to your doubts about your abilities, or the veracity of what you’re saying. It’s deceptively easy and simple to read, but not everybody can do that. BD: Well, thank you. I still don’t think of myself as a writer, though. The good thing about putting those books together is that at least it clears out files in the brain: it empties them so I don’t have to think about them anymore. It gives me space where I can start again. Is it an enjoyable experience for you, writing? BD: I hate it. It is difficult, there’s no question of that. I get quite a bit out of it, but every day I have to set myself goals to get it done; To not allow myself a cup of tea until I’ve got a certain amount of words done. I once hit a high stretch where I did 25,000 words in a couple of days. And that was because I was really pushing myself. I wasn’t doing a Kerouac, on Benzedrine or anything; it was just having to get the book finished. I just sat in this empty flat, and did it. Do you consider yourself an artist, if you had to put some definition on what you’re doing? BD: I sometimes try to think of myself as an artist. The fact that I went to art school for three years, from the ages of seventeen to twenty-one, that kind of defines the way you approach what you’re doing, whether it’s me managing bands, or making records, or writing books… I never thought of myself as a manager, I never thought of myself as a musician, even though I can pick up a guitar and put down some chords; I never thought of myself as a writer, even though I can put words together. I feel like it’s all been done with the mind set of those first three years at art school. But as for me being an artist, I’m not. At one point I was experimenting with the idea of me being a poet, with all these things I’ve done, because it was the one thing that was even more pretentious than saying you’re an artist. But I don’t know.